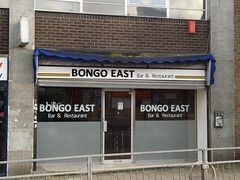 Bongo East was a Ghanaian restaurant and bar in Barking. It has now closed. As of mid-2015 the premises are occupied by a Bulgarian cafe called BG Zakuska. Ghanaian restaurant and bar in Barking. It's fairly small, seating around 40 people. The decor is simple but well thought out, with terracotta tile-style flooring, colourful art prints on the otherwise-plain walls, and recessed spotlighting in the ceiling. Two large mirrors face each other across the width of the restaurant, adding an increased feel of spaciousness. Full-length windows at the front let in the light during the day, with half-frosting for privacy. Kake visited on a Tuesday evening in February 2014. There were no other customers when I arrived around 6pm, and this remained the case during my visit. The TV was showing sports news with the sound on, fairly loud. The lighting was quite dim. I went for fufu with soup and meat (£8), and was offered the option of having my fufu served in the soup or on the side. Fufu is eaten by pulling off a small piece with one's fingers and dipping it in the accompanying soup/stew, and so a bowl of warm water was brought to the table for me to wash my hands. It was all tasty enough, with a good level of spiciness in the soup. The meat itself was a mixture of muscle meat and tendon, giving a good contrast of textures. According to the menu as of February 2014, they serve halal food. Kake's verdict: I'd visit again if I was in the area. I'd like to try their kelewele (spiced fried plantain). Accessibility: There's a step to get in; some attempt has been made to get around this with a sort of sideways ramp, but this is a bit awkward too, particularly if there's nobody to hold the door for you. Once you're in, it's step-free to the toilet (a single unisex cubicle). There's a reasonable amount of space between the tables, and a wide aisle in the middle. Last visited by Kake, February 2014. Last edited 2015-11-22 06:35:47 (version 5; diff). List all versions. Page last edited 2015-11-22 06:35:47 (version 5).